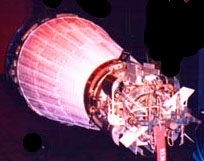 SNAP-10A was the only nuclear reactor launched and flight tested by the United States. 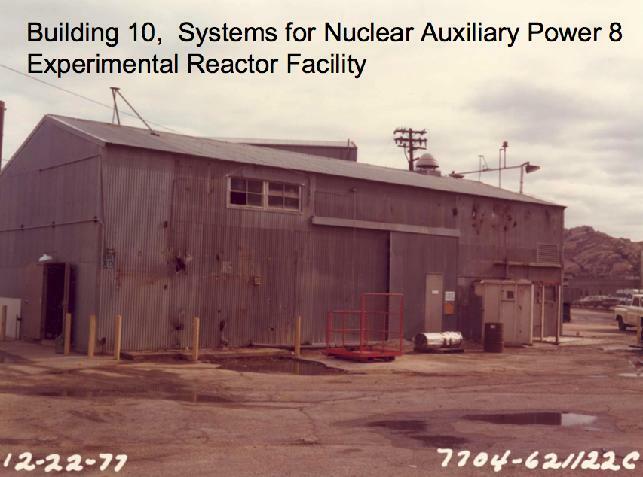 The reactor was developed under the Systems Nuclear Auxiliary Power Program (SNAP) program overseen by the U.S. Atomic Energy Commission. 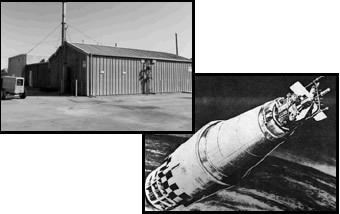 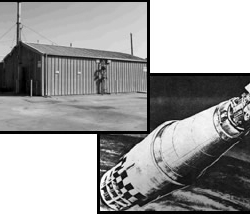 Launched by an ATLAS Agena D rocket on April 3, 1965, SNAP-10A maintained a low earth orbit for 43 days, while its nuclear electrical source, made up of thermoelectric elements, provided over 500 watts of electrical power. 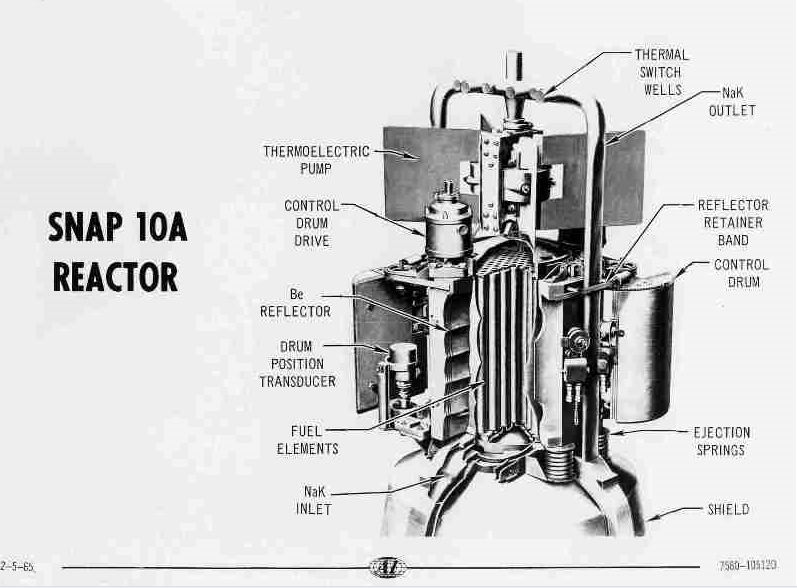 The SNAP-10A has three major components: a compact nuclear reactor, the reactor reflector and control system, a heat transfer and power conversion system. 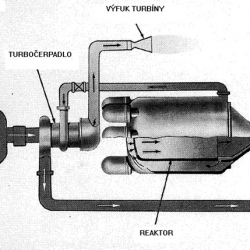 The reactor measured 22.4 cm wide by 39.62 cm long and held thirty seven fuel rods containing uranium-zirconium-hydride fuel. 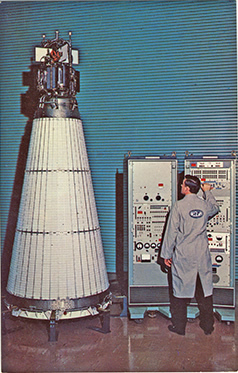 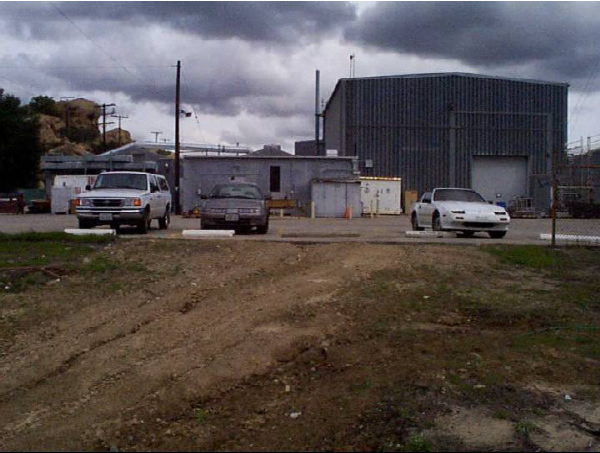 The reactor can be identified at the top of the SNAP-10A unit. 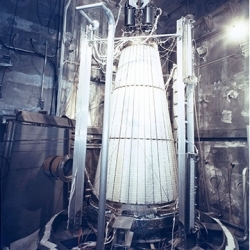 Reflectors were arranged around the outside of the reactor to provide the means to control the reactor. 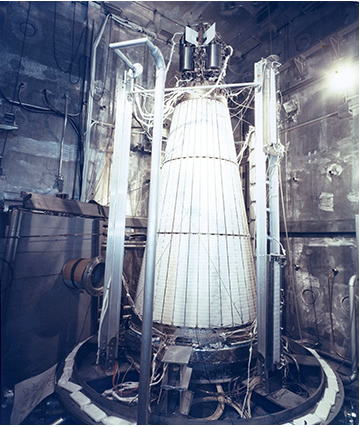 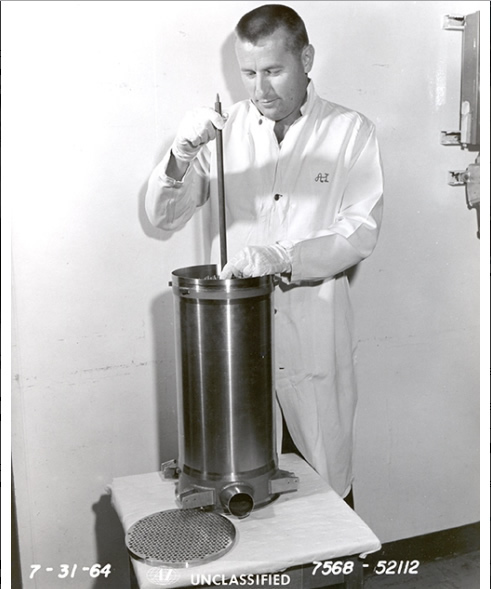 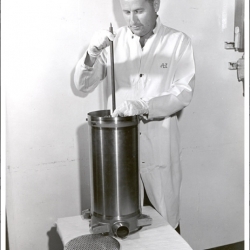 The reflectors were composed of a layer of beryllium which would reflect neutrons thus allowing the reactor to begin and maintain the fission process. 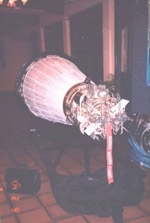 The reflectors were held in place by a retaining band anchored by an explosive bolt. 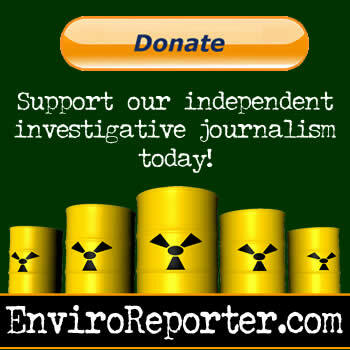 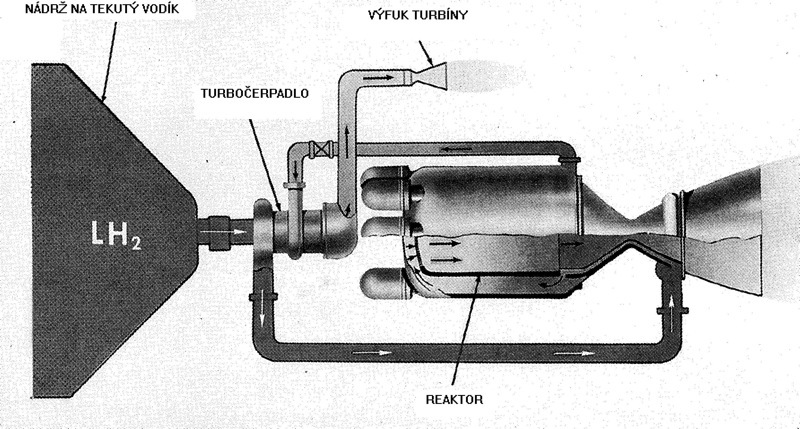 When the reflector was ejected from the unit, the reactor could not sustain the nuclear fission reaction and the reactor permanently shut down. 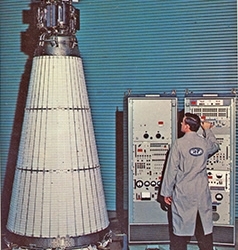 The eutectic sodium-potassium (NaK) alloy was used as a coolant in the SNAP-10A. 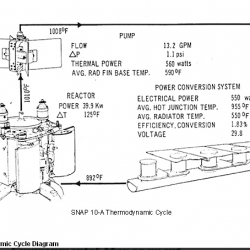 The NaK was circulated through the core and thermoelectric converters by a liquid metal direct current conduction-type pump. 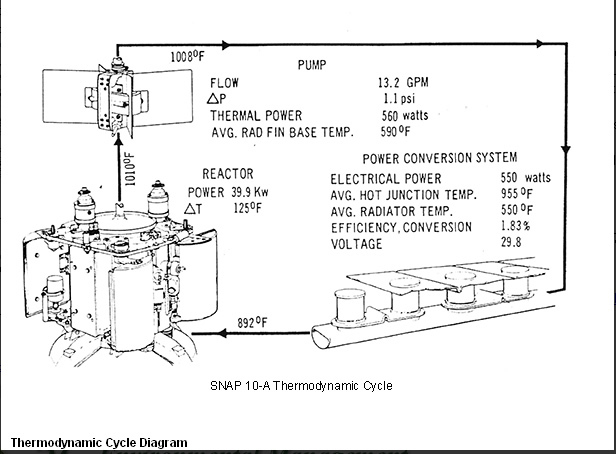 The temperature difference between the NaK on one side of the thermoelectric converter and the cold environs of space on the other created an electric potential and usable electricity.